The papers of Harold E. Stassen, former President of the University of Pennsylvania, consist primarily of Stassen’s public speeches arranged chronologically from 1945 to 1957. Included in the collection are two additional items relating to Stassen’s tenure as university president: a presentation to the Ford Foundation, n.d. and a letter to Mrs. Jane Seymour Blomfield, dated October 24, 1950. Harold E. Stassen – national political leader, president of the University of Pennsylvania, and later, perennial candidate for public office – was born on April 13, 1907 in West St. Paul, Minnesota to William Andrew Stassen, a farmer, and Elsie Emma Mueller. Stassen’s political aspirations began early in his life. He graduated from high school at the age of fifteen and entered the University of Minnesota a year later. While in school, he served as president of the student body and chairman of the Minnesota Young Republican League, an organization that he founded and would later draw from as his political base. Upon completion of his undergraduate degree, Stassen entered the University of Minnesota’s law school, graduating in 1929. Almost immediately, Stassen and a classmate opened law offices in South St. Paul. In the same year, Stassen made the first move in a political career that was as remarkable for its early triumphs as it was bewildering in its string of later defeats. He won the race for Dakota County attorney (located just south of Minneapolis-St. Paul), assuming office at the age of twenty-three and holding the post through a series of reelections. In 1938, Stassen, with the support of his Young Republicans, successfully wrested power from the state’s old-guard Republicans to become, at the age of thirty one, the youngest governor in Minnesota’s history. After he delivered the keynote address at the Republican National Convention, during which he helped to clinch the nomination for Wendell Willkie, Stassen was reelected governor of Minnesota in 1940 and 1942. He did not finish his last term, instead joining the Navy in 1943 as a lieutenant commander and serving as chief of staff to Admiral William Halsey in the South Pacific. In 1945, President Roosevelt named Stassen to the American delegation to the first United Nations conference in San Francisco, where he helped to write the UN Charter. In 1948, Stassen made his first and strongest bid for the White House. His early victories in Republican primaries seemed to indicate that Stassen would beat President Harry Truman, but that summer, at the GOP convention in Philadelphia, Stassen lost the nomination to New York Governor Thomas Dewey. In the wake of his unsuccessful bid for the Republican nomination, the Board of Trustees of the University of Pennsylvania chose Stassen to fill the office of the president, left vacant by the sudden retirement of George McClelland. When Stassen assumed office, Penn was in the middle of a long-term financial crisis. As a skilled fundraiser, Stassen helped to raise money and cut costs, channeling Penn’s financial resources into a few prestigious departments at the expense of others. Stassen also focused on fulfilling McClelland’s campus expansion plan, as well as reforming intercollegiate athletics in order to conform to the requirements of the new Ivy League. Stassen’s emphasis on athletics focused primarily on Penn’s football teams, for which he attempted to garner maximum national exposure. Believing that academic excellence was not incompatible with gridiron success, Stassen engaged in a highly-publicized fight with the NCAA over televising Quaker home games. When the NCAA voted to restrict the number of televised games in order to stop the slide in gate attendance, Stassen defied the order and signed a $200,000 contract with ABC. Eventually, however, Stassen was forced to back down when the NCAA threatened to expel the Quakers. His actions left Penn’s national reputation damaged and relations with its peer institutions profoundly frayed. Stassen was frequently absent from campus, particularly during the 1952 spring semester when he made another bid for the Republican Presidential nomination; Stassen also took an extended leave of absence for a speaking tour in Asia. On campus, he was heavily criticized for using Penn as a political staging ground. 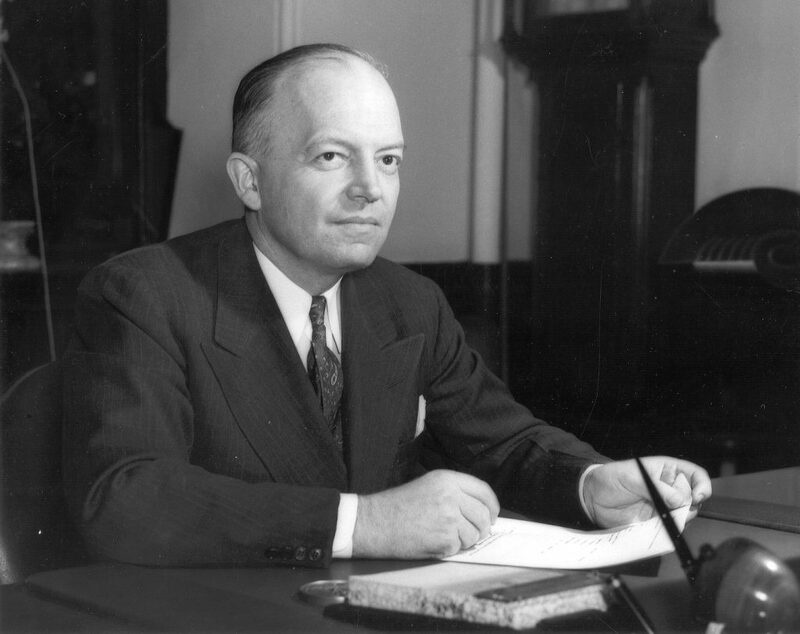 When newly-elected President Eisenhower offered Stassen a position in his American foreign aid administration, neither the Board nor the University at large was surprised when he accepted. Stassen kept few ties to the University after his term ended. Following his initial appointment by Eisenhower, he continued to dabble in politics. When Stassen left the Eisenhower administration in 1958, he became a candidate for the Republican nomination for governor of Pennsylvania. His defeat by a large margin signaled the end of his importance as a political figure, despite his candidacy for a number of positions in the following years. Between 1948 and 1992, he campaigned nine times for the Republican Party nomination for President, never coming close to winning after 1948. He also ran for governor of Minnesota four times (winning his first two attempts), governor of Pennsylvania twice, the United States Senate twice, and mayor of Philadelphia once. Throughout his political trials, Stassen maintained a successful law practice in Philadelphia. Despite his political defeats, Stassen remained active in politics until his death. He gained a reputation as a liberal Republican when, as president of the American Baptist Convention in 1963, he joined Martin Luther King in his march on Washington, D.C. On his 90th birthday in 1998, Stassen was still working on a 129-page proposal to revise the United Nations Charter. He even filed for the 1998 Minnesota gubernatorial race eventually won by Jesse Ventura. Stassen married Esther Glewwe in 1929, with whom he had two children. He died on March 4, 2001 at the age of ninety three. The Harold E. Stassen Papers document the political and professional career of the national political leader and brief University President. The bulk of the collection consists of speeches made by Stassen between 1945 and 1950 delivered at local and statewide organizations and functions. Most of the speeches relate to Stassen’s failed political campaign for the Republican Presidential nomination in 1948 and again in 1952. The majority of the speeches treat issues in postwar international affairs – Cold War politics, the threat of Communism, the prevention of a third world war – with a particular emphasis on Stassen’s role in drafting the United Nations Charter. Other topics addressed by Stassen include domestic labor and agricultural policy and progressive reform of the Republican platform. All of the speeches are typed transcripts, and most are designated for release to the press and radio. A large number of the speeches were later read as statewide and national radio broadcasts. Most widely documented are Stassen’s speeches while President of the University of Pennsylvania from 1948 to 1953. During those years, Stassen’s speeches are designated as originating from 101 College Hall. The majority of the material from Stassen’s tenure as President continues to treat national and international political issues, though Stassen does give a greater emphasis to education in his speeches. An index of Stassen’s speeches from 1940 to 1951 lists the date and place of every speech made by Stassen during that period. That majority of the speeches, which took place throughout the country, were delivered at small-scale conventions, association meetings, and community events. Speeches, 1948 Jan. – Sept. Speeches, 1948 Oct. – 1949 Apr. Presentation to the Ford Foundation, n.d.